There are several areas of refuge in the shopping mall of shopping malls we all know as South Coast Plaza. Macy’s Signature Kitchen is one of them. In the deserted food court where no one really eats, Marcus Samuellson’s MarcBurger still puts out one of the best frozen custards around. But even that oasis of calm isn’t as good or as cozy as Zcafe’s semi-outdoor lounge. So let’s just keep this tip between you and me, mmm’kay? Zcafe’s space, shaded by the building’s overhang but otherwise open to the air at the west end of the Bridge of Gardens (the pedestrian bridge that connect SCP to Crystal Court), has plush couches, TVs, heat lamps, Wi-Fi, and what appears to be an actual futon for napping. I have used this space to sit, rest my calves, and even taken a five-minute snooze. So far the only souls who seemed to have discovered this hidden asylum are the Apple Store employees who routinely use it as their unofficial breakroom. But first a background: Zcafe used to be CPK ASAP (the fast food arm of California Pizza Kitchen), but since the Z Pizza conglomerate took it over and the space outside, the pace seemed to have slowed down for the better. I’m not even going to touch on the pizzas here, which are fine but not great. 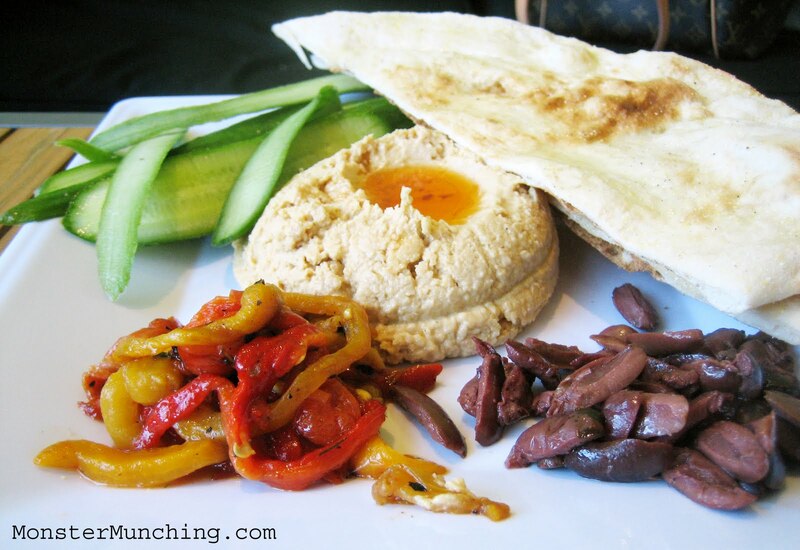 I will, however, talk about the hummus--the only thing you should ever need to order. It’s the perfect food for the space, which I treat as a rest stop, a respite from my chores--a refueling station, if you will. You don’t want to be weighed down with anything leaden with cheese. A light iced tea should be the beverage to sip with the hummus, a decidedly Mediterranean meal with spears of cooling cucumber, piquant olives, sweet as sugar marinated peppers, and a crispy plank of pizza bread doubling as pita with which to scoop up the dip. I didn’t expect it to be good, let alone supplied with fresh vegetables, but it was this and more. On top of Mt. Hummus a pool of olive oil shimmered. And it’s relatively cheap for SCP. This $5.95 appetizer plate will feed two easily and could constitute a light lunch for vegetarians or a mid afternoon snack for the rest of us. I went out to try this hummus plate specifically after reading your post! Sadly, I didn't love it. I found the hummus to be gluey and oily, with a peanut-butter like taste, oddly enough. Maybe it was a bad batch? I did try their soup of the day, which was a beef barley and it was surprisingly really good, tasted homemade with a comforting, flavorful broth. Thanks for the rec! Or maybe I got the one good batch! Thanks for trying out the recommendation and reporting back. I've been back about two more times since the hummus, and I can say that the chicken and apple pizza had a bit too much going on (as I only casually touched on in the writeup) but man, I do like lounging in that little area though. That sounds like a great way to fuel up midway through navigating the huge complex that is South Coast Plaza. I was surprised to see CPK go, but at least there is a good replacement! It's probably the best place to chill (although too literally right now because it's freezing) when you're mid-shopping spree! Does Marcburger still have custard, the website shows Häagen-Dazs?